The changing dynamics of warfare will create an opportunity worth US$1,500.9 mn in the global nanosensors market by the end of 2021. The phenomenal uptake of nanosensors will be attributable to their burgeoning demand in the military and home security sectors, observes Transparency Market Research. The cost-effectiveness of manufacturing nanosensors and their compactness make them the preferred choice of sensors amongst various industrial sectors. As of 2014, the valuation of the global nanosensors market stood at US$26.9 mn and is expected to expand at an exceptionally high CAGR of 80.7% over the forecast period. The emergence of several industries across Asia Pacific will present lucrative opportunities to the nanosensors market as well. The growing focus on food management is also expected to spur demand for nanosensors as they will prove critical to ensuring quality control in the production of food and beverages. The extensive application of nanosensors in robotics and in Internet of Things (IoT) in the forthcoming years will also create high-value opportunities for the overall market. The difficulty in large-scale production of nanosensors is the only restraint on the overall market currently, says TMR. North America dominated the global nanosensors market, accounting for about 39.4% of the total market revenue in 2014. This share was closely followed by Europe and Asia Pacific. North America will continue to lead the global market are the nanosensors market in the region is expected to progress at a strong CAGR of 81.2% between 2015 and 2021. The consistent innovations and investments in research and development of nanosensors to appeal to a wider consumer base have led to several technological advancements in this market. The Asia Pacific nanosensors market is also on the verge of revolutionizing costs pertaining the diagnostics and improved therapies that are based on nanosensors. Both of these factors are likely to drive this regional market to a new high. China will lead this extraordinary growth in Asia Pacific due to ongoing technological upgradation in healthcare and biomedical segments. Homeland defense and military has been identified as the fastest-growing application segment of the global nanosensors market with a CAGR of 83.9% between 2015 and 2021. Efforts made to upgrade national security have been the fulcrum of this turn in the overall market. Technological advancements such as implantable nanosensors to monitor the health condition of the soldiers will ensure in raising a fitter force in the near future. The automotive and aerospace segment will also make a significant contribution to the overall earnings of the global nanosensors market. The need for enhanced climate control, fuel-efficiency, and ergonomic seating will collectively spike the demand for automotive nanosensors all through 2021. The leading players identified in the market are OMRON Corporation, Oxonica, Lockheed Martin Corporation, Texas Instruments Inc, Analog devices Inc, Samsung Electronics Co. Ltd., and Honeywell International, Inc. Analysts forecast that players will focus on strengthening their positions through mergers and acquisitions. Increasing geographical reach and developing innovative products to cater to the various industrial verticals will define the growth strategies of the players in the coming years. Nanosensors are defined as any surgical, biological or chemical points that are used to convey information about nanoparticles to macroscopic world. These are mainly used in biomedical and healthcare sector and also help in manufacturing other nanoproducts such as nanorobots and nanoscale. Nanosensors have revolutionized the semiconductor industry and are meant to evaluate and understand nanosystems. By product type, the global market for nanosensors has been segmented into: optical nanosensors, electrochemical nanosensors and electromagnetic nanosensors. By application, the global market for nanosensors has been segmented into: automotive and aerospace, homeland defense and military, biomedical and healthcare among others. The others segment includes energy monitoring, industrial control and robotics among others. In 2014, by product type, electrochemical nanosensors accounted for the largest market share globally. Increase in investments in research and development of carbon nanotube (CNT) used in nanosensors are the opportunities in the growth of CNT based electrochemical nanosensors. The application of nanosensors in biomedical and healthcare sector held the largest market share in 2014 and is expected to remain the market leader throughout the forecast period. Early detection and diagnosis of diseases followed by rapid response rate is one of the important factors driving the global biomedical and healthcare nanosensors market. Growing demand of nanosensors in homeland security and military is one of the important factors driving the global nanosensors market. With huge amount of investments being made in research and development activities and the advent of advanced new generation nanosensors equipments which helps in detection of toxic gases such as anthrax is also expected to have a positive impact on the nano sensors market. In military and homeland security, nano sensors are also used for detection of biotoxins and radiations. Thus, nanotechnology has enabled the manufacturers to develop advanced warfield gear such as self repairing tents and lighter vehicles which in turn is driving the global nanosensors market. In addition,cost effective manufacturing due to compactness of nanosensors is also having a positive impact on nanosensors market globally. Nanofabricated sensors aims at reducing plant production costs as these are mounted on wireless packages that eliminate cabling and wiring costs. This in turn is driving the global nanosensors market. Difficulty in mass production of nanosensors is restraining the growth of global nanosensors market. However, growth in emerging markets of Asia Pacific region, focus on food management industry and nanosensors applications in robotics and in the Internet of Things (IoT) are some of the major opportunities for the global nanosensors market. Introduction of Wireless sensor networks (WSN) in terms of sensing capabilities are the opportunities for the market to grow during the forecast period. North America held the largest market for the nanosensors market in terms revenue in 2014 and is projected to stay as the market leader over the forecast period. Technological innovations followed by continuous investments in research and development by key nanosensor manufacturers such as Samsung Electronics Co. Ltd., Honeywell International Inc. and Texas Instruments Inc among others to meet the changing consumer preferences are the main factors driving the North America nanosensors market. Europe is the second largest market for nanosensors in terms of revenue. France is the largest market for nanosensors in Europe. Technological innovations in signal processing and microelectronic technologies are the main factors driving the Europe nanosensors market. 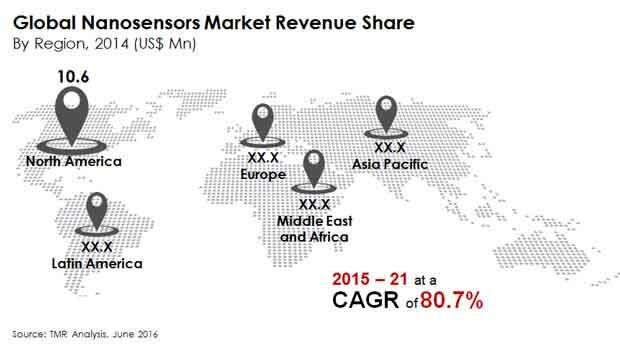 This report also provides an understanding of revenue (USD million) of nanosensors market. The study also provides forecast from 2015-2021 and highlights current and future market trends. The leading players in the Nanosensors market include OMRON Corporation, Texas Instruments Inc, Oxonica, Lockheed Martin Corporation, Analog devices Inc, Honeywell International, Inc. and Samsung Electronics Co. Ltd.